A better solution, we believe, is to strike the firesteel with the spine of your knife. Some knives (like those from Bark River) can do that right out of the box. On a knife with a "coated" blade (like an ESEE), however, you'll have to remove a small amount of the coating. 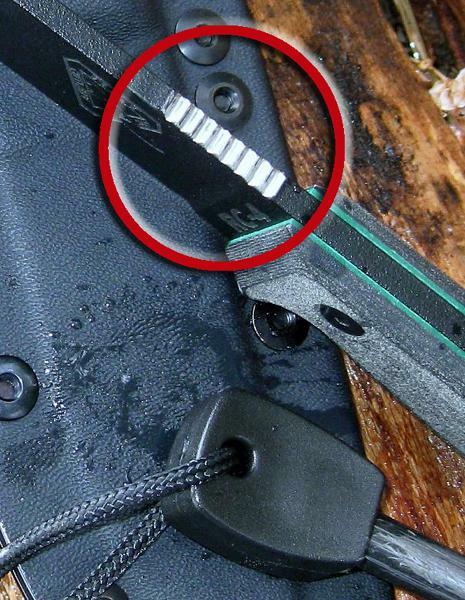 Using a small file (like a triangular needle file), carefully remove the coating from the jigged section of the knife’s spine (circled in the photo). Try to maintain the squared profile of the spine, remembering that the idea here is to create a bare-metal section with sharp, well-defined corners that’ll get a good "bite" into the firesteel. That’s all there is to it -- now you can use the spine of your hard-working ESEE knife to strike a firesteel!